Just try to stay cool among Neko Cat Café's purring fur balls of joy. Follow the sign to Capitol Hill's new kitty den. “It’s really hard to work in a room with eight cats.” That’s one of the first things owner Caitlin Unsell tells me as we sit down at a table shaped like a cat face along the pillow-lined bench seating in the bright, airy cat room of Neko Cat Café. Seattle's second such kitty parlor, Neko opened this week on the Pike/Pine corridor of Capitol Hill. I soon realized how right she was as a silky soft kitty named Stitch jumped up onto my lap, where he quickly made himself comfortable. I lost my train of thought and my professional demeanor entirely, but I was in cat heaven. Unsell is a first-time business owner who was blown away by the cat cafés she encountered in Japan, where she lived for two years. “I visited as many as I could and I knew that as soon as I got back to Seattle I had to open one here,” she says. Another two years later, her tribute to these Japanese institutions is up and running, with a menu of light snacks including senbei (Japanese rice crackers), Taiyaki (fish-shaped Japanese waffles) and $11 bento box lunches. Drinks range from beer—including Black Raven’s catnip-infused Kitty Kat Blues pale ale—to wine, coffee and, of course, both Japanese tea and sake. Neko actually means “cat” in Japanese. Neko joins Seattle Meowtropolitan in Wallingford and The Kitty Catfe in Edmonds as part of a growing trend that unites Seattleites’ love of café culture and petting cute animals. Unsell has partnered with Regional Animal Services of King County to help lucky cats find permanent homes. All of Neko’s cats are available to adopt if you connect with one, which is all too easy to do when they are this loving and cute. Most of their current cats are adults, though at 5 months old, McGee is still a kitten. All of the cats Neko will take in are diagnosed with feline leukemia virus, a disease that poses long-term health risks but does not otherwise keep them from living a happy, comfortable life. People often pass over older and ill cats at shelters, but when you get to know them in an environment like Neko’s clean, comfortable and stylish space these sleepy old-timers are every bit as endearing as a more rambunctious younger cat. 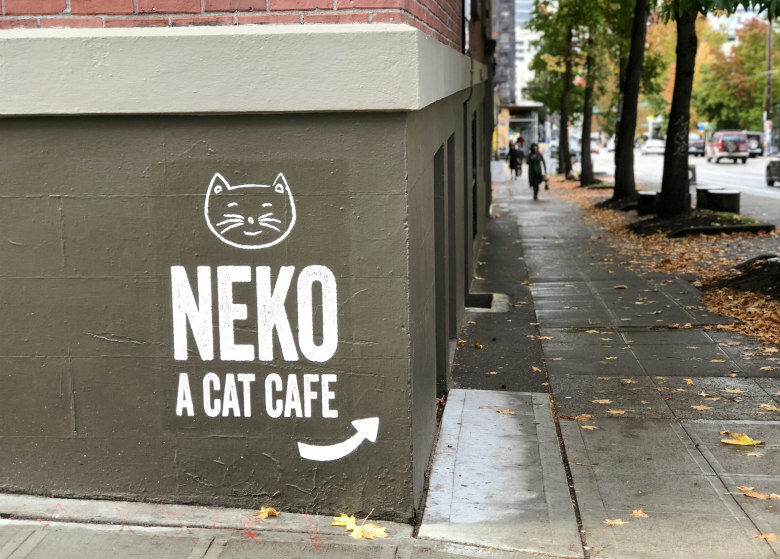 In keeping with Seattle health codes, Neko is divided into two areas: the café itself and the cat room. The food and drink area is hung with incandescent light fixtures inside impressively large glass globes that provide the ample lighting necessary for a space that is several steps down from the sidewalk. The cat room is lined with windows at pavement level that the cats (especially Abby) love to look out, often to the surprise of Capitol Hill’s many passing dogs. Cat appointments are available by reservation on the website or on a walk-in basis, though they are encouraging reservations and have already received hundreds. “We’re planning on hosting kitten adoption days,” Unsell teases, where Neko will bring in a group of kittens with the goal of sending them all to good homes by the end of the day. Luckily, those who cannot take one in can always visit Neko.